Ice Skating is for All!!! The cold season is finally here YAY (NOOO) !!!! That means we are setting up our dinner tables for holiday feasts and running through the stores trying to get the best shopping deals. During these times, many of us are forgetting one very important thing!! That one thing is PHYSICAL ACTIVITY!!! Ice Skating is one form of physical activity that is very popular during the winter season. It can done individually, or even with your family!! Most importantly it is a great way of improving your quality of health. Laura Sims Skate House in Cobbs Creek Park, located at 63rd and Walnut Street. Admission is FREE and skate rentals are only $3! To learn more about facility hours, check out their website! Rizzo Rink, located at 1001 Front Street. 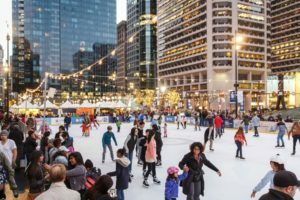 Rizzo Rink opens to the public November 23rd with FREE Admission and $4 skate rentals! To learn more about facility hours, check out their website! Tarken Ice Rink & Rec Center, located at 6250 Frontenac Street. Check out their Facebook page for more info! Simons Ice Rink, located at 7200 Woolston Ave in West Oak Lane. Admission is FREE and skate rentals are $2. For more information about facility hours, check out their website! Scanlon Recreation Center & Ice Rink, located 1099 East Venango. For more information, check out their Face page!